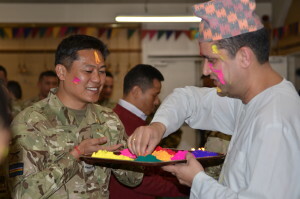 Gurkhas based all over the UK, Brunei and Nepal celebrated the Hindu Festival of colours; Holi. It marks the beginning of spring and symbolises new beginnings. It’s a time to put conflicts and worries behind you and to start a fresh. It also commemorates the story of Prahlada, which is seen to symbolise good overcoming evil. 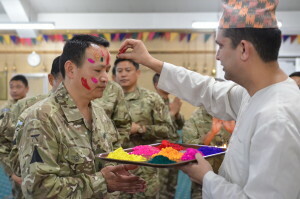 Soldiers from 2 RGR and The Band of The Brigade of Gurkhas celebrated Holi in Shorncliffe. 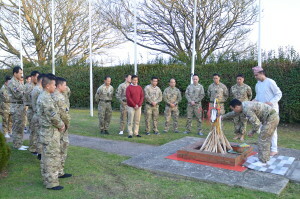 A temple service was organised in Sir John Moore Barracks to celebrate the event. 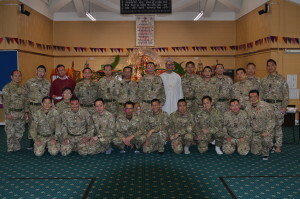 Meanwhile in Catterick, Gurkha Recruits celebrated the Hindu festival with lots of enthusiasm. In attendance were the potential RGR officers who were there to learn more about Gurkha cultures together with SO2 Comms/ Media, Maj James Arney RGR.